Master The Three Challenges that every entrepreneur must overcome to achieve their goals. Learn to become the leader your business demands and unlock your personal and business potential. Grow through The Three Challenges exercises with concrete examples and tools that deliver practical results. Nicolas Hauff focuses on you the entrepreneur first, because your business won’t reach its potential until you reach yours. Start now and discover your personal path to scalable results fast. "What makes this book so powerful is the brilliant combination of ideas and personal stories based on Nicolas' experience as a business owner and business consultant. I finished the book in one sitting and then immediately started to implement several ideas that were new to me. Highly recommended". "In business and in life, you’re either growing or you’re dying! The Three Challenges will help you grow personally as you grow professionally". "Every successful business endeavor has a leader who understands that self- mastery is where it all starts. However, you must also give clear direction to your company’s path and champion its performance as a whole. The The Three Challenges is an outstanding guide and one of the few books that will walk you through the personal and business aspects of being an entrepreneur". 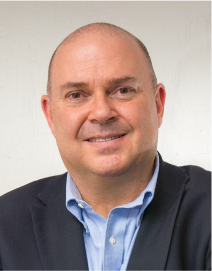 Nicolas Hauff has equipped hundreds of small and mid-sized companies with tools for growth. With a multinational background and over 25 years of experience in the fields of information technology and business training, he believes that regardless of our profession or position, we must always remember that we are human beings first. Having been through successes and struggles in his own entrepreneurial path, Nicolas has a huge passion for candidly sharing his knowledge and experiences with other business owners to help them avoid the most common pitfalls and thrive as entrepreneurs. Are You Ready To Master Yourself? 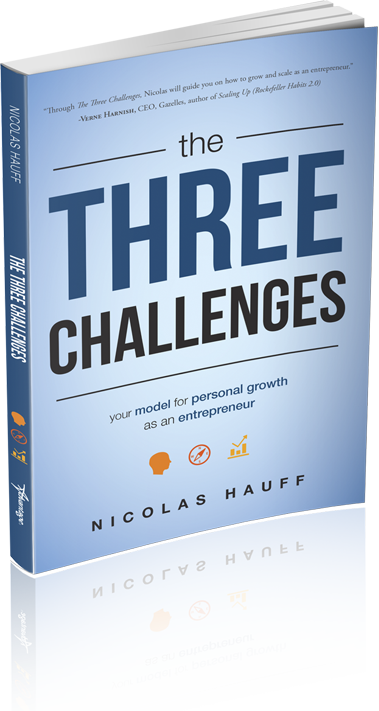 In these exercises Nicolas introduces you to the most important tools you need to overcome the three critical challenges that every entrepreneur will face. He brings together diverse concepts from across the business success landscape and distills them into a simple yet effective set of tools for you. Complete The Three Challenges and you will immediately have the clarity to improve your life and business. “Mastering yourself first” rightly focuses on the most important, and difficult, entity to gain mastery over on the road to a successful life: you. In this section, Nicolas provides a simple and practical process (with tools) to help you move in the direction of self-mastery. It can be a laborious and, at times, discouraging process, but take heart: Greatness awaits on the other side of this discovery process (which, to be honest, never really ends!). “Mastering your company’s direction” comes next, but growth company CEOs often place it first in life. How do we know this? Have you observed the number of CEOs with broken marriages, addictions, and mental imbalances? Self-mastery is paramount. Only then are you ready to master the direction of your company through a relevant, aligned shared vision and set of core values. Nicolas offers insights into how he did this and how to keep your company’s direction current as times, economies, and technologies changes. “Mastering your company’s performance” is the third step to success and requires an ongoing balance between “results orientation” and “relationship building.” It requires paying equal attention and investing in both “cash” and “culture” in your company. In this section, Nicolas provides guidance on practical tools to achieve and maintain this dynamic balance. "Success is about the stories you tell yourself. It is the unseen narrative that plays out in the seven inches between your two ears that will ultimately dictate your direction and success in life. What stories are you telling yourself? Do you wish to change them?" and grow in life and business today.